ISON Comet Viewer 1.0 displays the celestial path and the tropical positions of ISON - comet of 2013 - with estimated apparent magnitudes and the values of the distance from Earth from 1 October 2013 until 31 January 2014, day by day. Comet C/2012 S1 ISON is being called the 'Comet of the Century', it will be nearly as bright as the Full Moon in late November 2013. (By some calculations it may blaze brighter then the Full Moon.) Keep track of this 'once-in-a-civilisation's-lifetime event' - or leastwise 'once-in-a-lifetime light show'. ISON Comet of 2013 Astrology Software displays the celestial path and the tropical positions of this unique comet, it presents simultaneously the estimated apparent magnitudes and the values of its distance from Earth. Displayed data: from 1 October 2013 until 31 January 2014, day by day. Magnitudes values: estimated in January 2013. 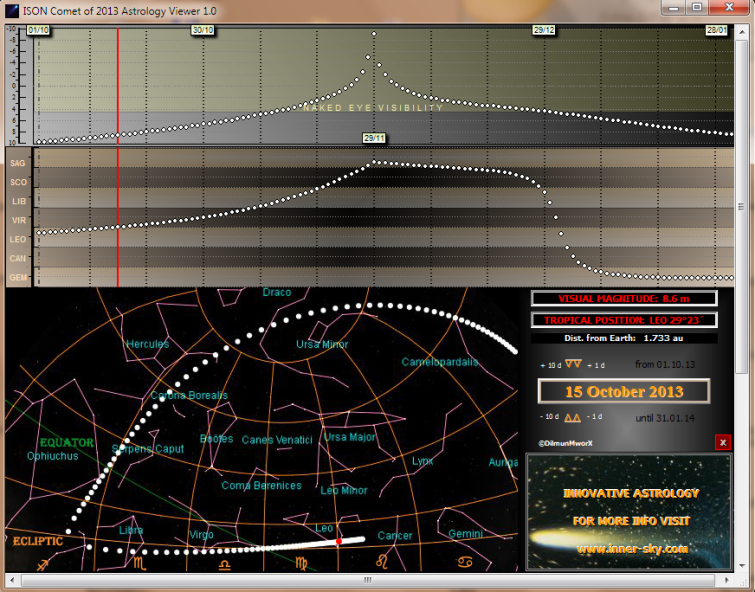 Of course, this program can be useful for amateur astronomers or 'stargazers' too.